Great title for a ski/water park weekend huh? Well it pretty much describes our weekend at Boyne Mountain up near Boyne Falls, MI. Gary had been planning this trip for months, getting the best deal, checking on all the questions we had, getting rentals taken care of. Needless to say, days before we left, he couldn’t sleep at night he was excited to go. Mind you, this was just a weekend trip 3 hours north of where we lived. This was supposed to the ultimate-everyone has a great time-Gary fulfills both loves of skiing and waterparking weekend. And it was a lot of fun, but let me get the bad and the gross out of the way. Well I guess the bad and the gross go hand in hand. The first bad is that Friday night/Saturday morning was the worst night we’ve ever had with the girls. Usually they sleep great, maybe not perfect when we’re in new surroundings, but usually through the night. The condo we had was set up perfect to let them have a good nights sleep in a big room. My in-laws had the master suite off the backside where we found ourselves hanging out there mostly b/c you could watch the skiiers and snowboarders coming down the hill, lots of floor space, a TV and big bed to lounge on. Then at the front of the condo was the smallish kitchen, living room and dining room where we dumped all our hats, gloves, snowpants, boots, babies, blankies, you name it. Then off to the left was our space and the loft Sheila slept in. 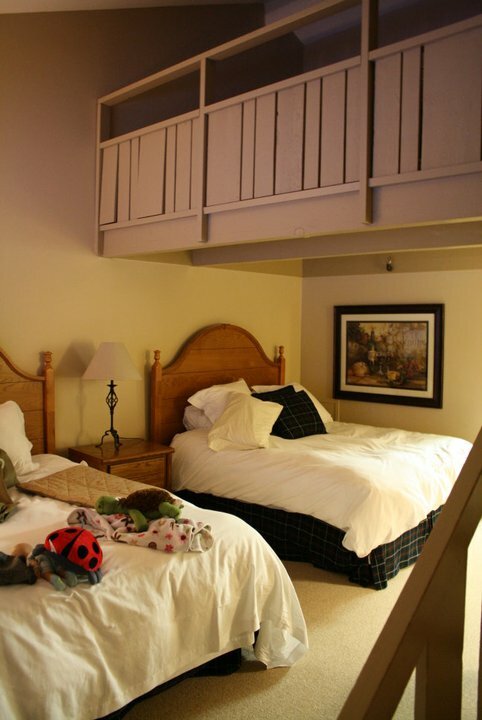 There were 2 queen beds and lots of floor space and the loft had 2 twin beds. With that was a full bathroom and closet. It was great! We tucked Anna into one queen bed and Izzy set up camp in her pack and play yet. Everything was super up until we went to bed…. Izzy woke up 3 times within a couple hours acting very confused and scared in her surroundings. So she ended up in bed with us. Then Anna woke up crying around 3ish for whatever reason, so Gary laid with her for awhile, then we switched, then I came back to bed and Izzy complied with going back in her own bed. So that’s about 6 times up. Around 7am, Anna asked for books to read in her bed and about 7:30 she sat up gagging. I ran over to her and ::enter gross #1:: she threw up in my hand. It wasn’t stomach remains just stomach acid. Along with that was a fever. A fever mommy didn’t prepare for so 2 phone calls later, Gary and his dad went into town to buy medicine, juice and Gatorade. She “threw up” 2 more times that morning and we battled a fever throughout the day. With a status on Facebook of Anna being sick, her caretakers commented and said strep throat was going around. Oye… So she ate on and off when her throat (which we didn’t totally knew hurt until Sunday) didn’t hurt. So the bad is that Anna was sick for most of the weekend she was supposed be spending learning how to ski and living it up in the indoor waterpark (and gross #1). 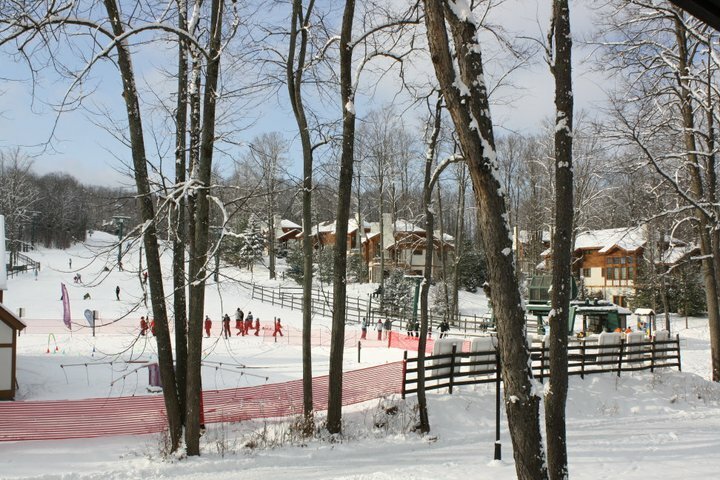 Erase all those visuals and come down the happy path of our weekend at Boyne. Friday we got up there (after horrible almost white out conditions) to a little village tucked in the middle of nowhere with lots of friendly people working the grounds. We checked in and got into our spacious condo. We hemmed and hawed about who was going skiing and who was going to the waterpark. Gary was anxious to hit the slopes so the boys took to the hills while the girls stormed the waterpark. FYI: Don’t forget swim diapers for non-potty trained little ones. They cost $4.50 each! Yes, that’s one single one time use swim diaper. Oye. The girls had an absolute blast swimming and going down the little water slide over and over and over again….. Izzy is more stable on her feet than last summer so she was able to walk around the 2 foot pool (up to her chin mind you!) and only go under a dozen times or so only to keep doing it again and again. I was excited for them for Saturday. Unfortunately the above incidents prohibited us from going back to the waterpark again. I love how much they love the water. I’m excited for the summer again to hit up the lake and Michigan’s Adventure (which Anna still talks about)! Saturday morning brought my first real attempt at skiing. Back story: I can only share this as a lot of time has passed and I’ve made huge strides in my weightloss. 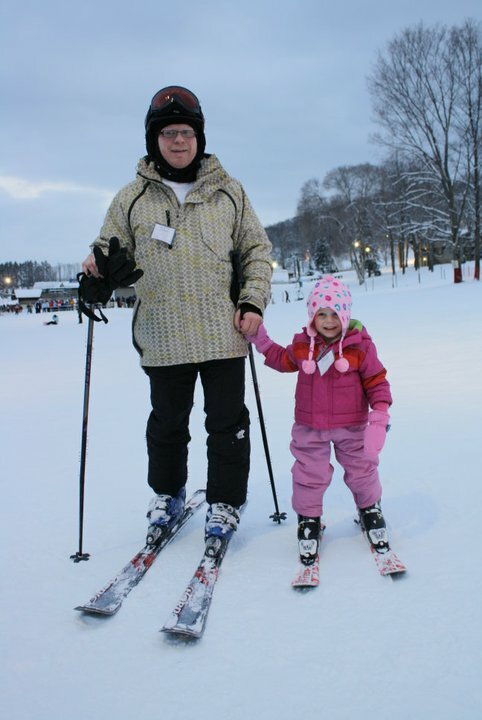 I tried to ski about 5 years ago but only got to the boot fitting. We didn’t go for an official fitting a place specializing in such things but just took it from the rental area of the ski hill. This proved quite painful emotionally as the boots wouldn’t fit over my calves. I ended up leaving as I was so embarrassed and upset. This was one of the turning points for my weightloss journey. 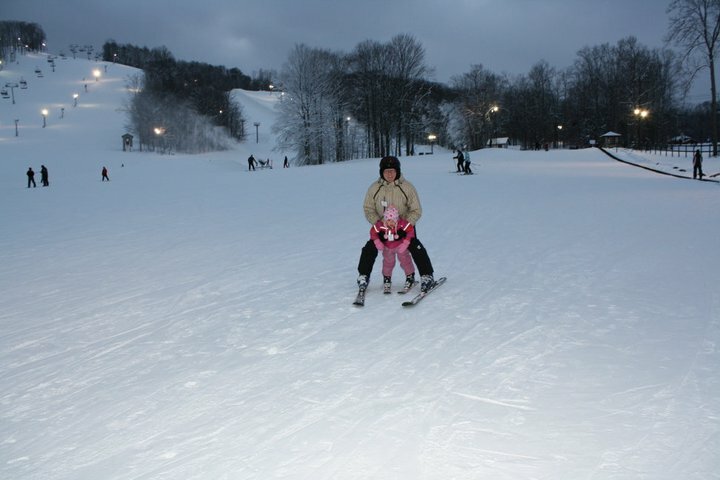 The next year I tried snowboarding b/c those boots were more forgiving but ended up falling way too much for my liking. So I banded trying either for years. But there was no excuse this time. I was down 73 pounds and I got fitted for boots with no problems at all! Back to this weekend: I got all my gear on with nerves running through me but I made it up the Magic Carpet with little problems and went down the very gradual hill with more ease than I thought I’d have! I then took up the chair lift to go up the mountain a bit more and fell off both times. Not as terrible as I thought but realized I needed to get into the weightroom more! I went down the hill a few more times that day and did a new run Sunday morning, never falling on any of the runs. Gary talked me through whatever issue I was having or emotion I was feeling. He’s such an patient and understanding man, it made it that much more enjoyable for me. 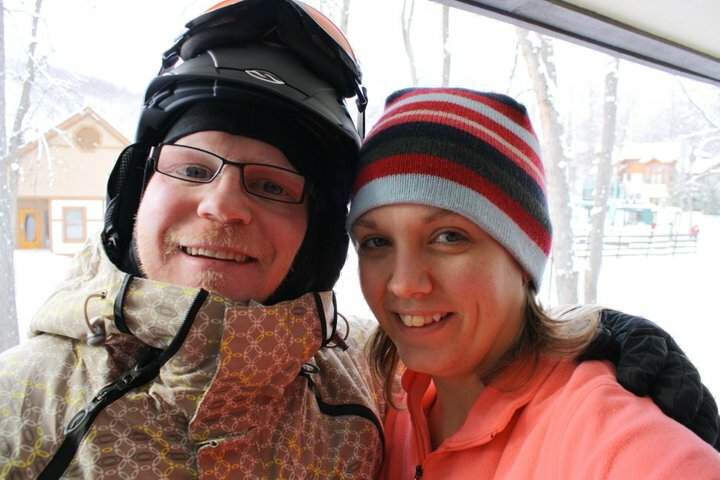 And he’s pretty hot in his skiing garb. It was beautiful, nerve-racking and exciting all at the same time. In liu of losing you in my incredibly long post, I’ll just say I’m excited to ski more, my husband is beyond thrilled that I liked it and I’m looking forward to it being a family sport one day. We had a great time hanging out with the family, had some great meals, snacked a lot, hit up the endless breakfast buffet, shopped the few shops on site, enjoyed the amazing sunny Michigan days (we’ve had a lot of those lately!) and overall had a great experience. With all that said, they refunded us for the waterpark since they saw us call about a sick child on Saturday and a little more for a plunger incident. 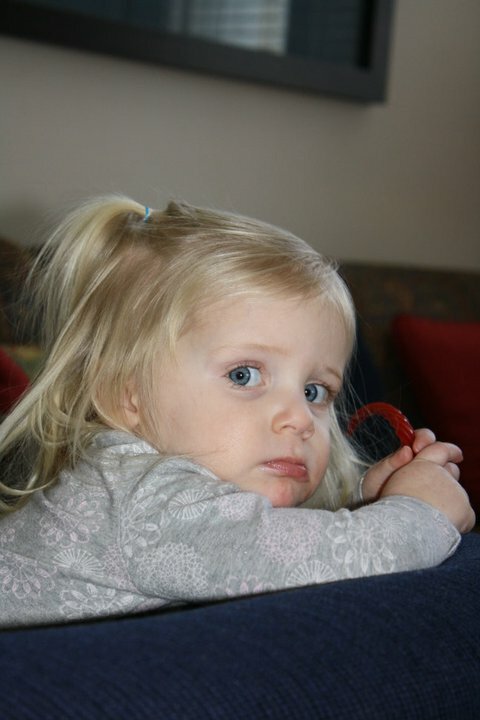 Anna’s on the other side of strep throat, we’re praying the rest of us don’t get it and we’re preparing for an adults only ski weekend in February. 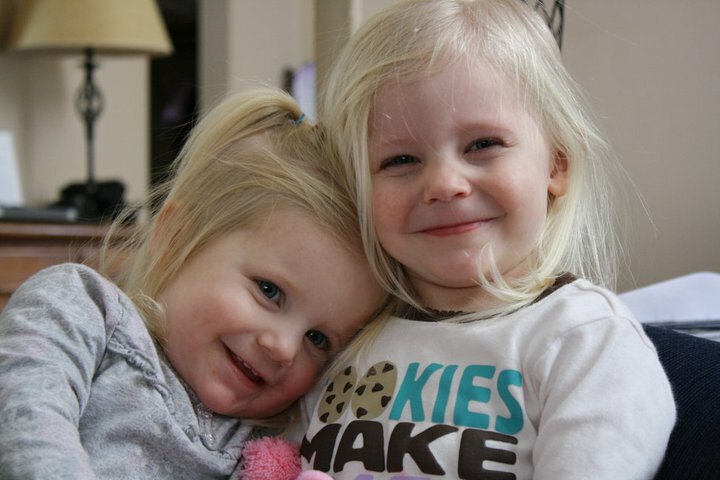 Now on to celebrating the wee little one’s 2nd birthday! 2?! Where did the time go! ?